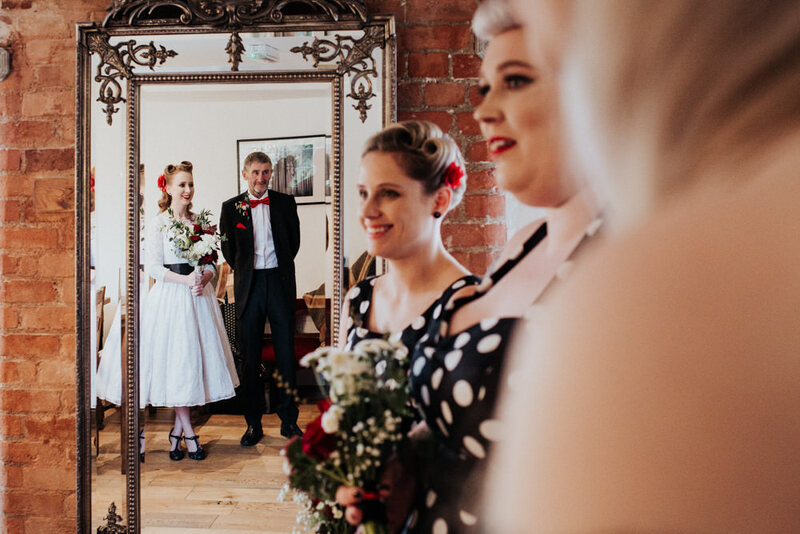 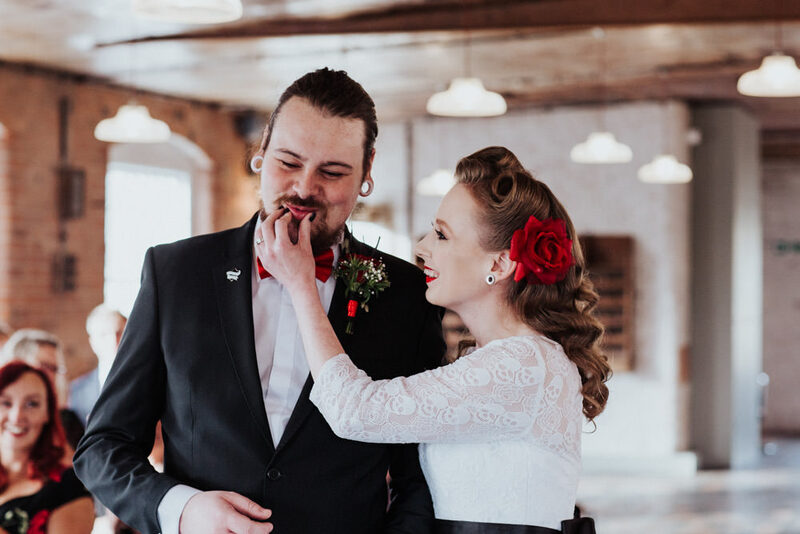 IF YOU LOVE SOMETHING A LITTLE ALTERNATIVE, THEN YOU’LL ADORE THIS ROCKABILLY WEST MILL WEDDING! 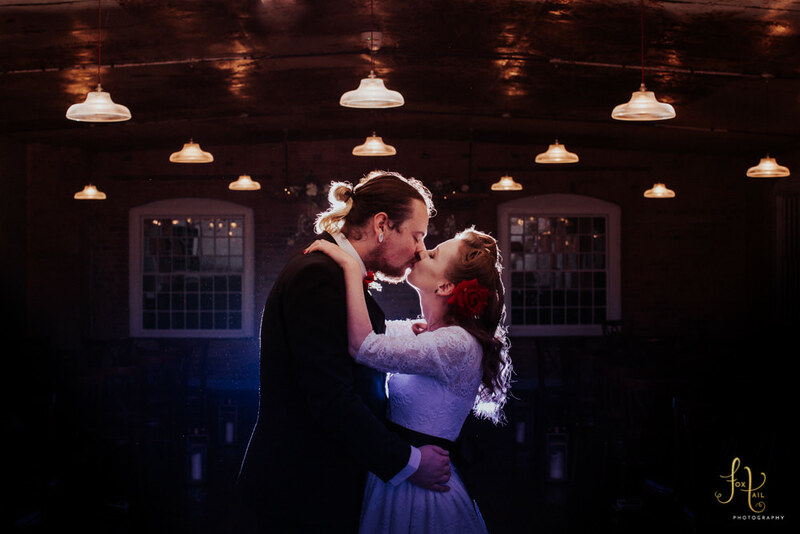 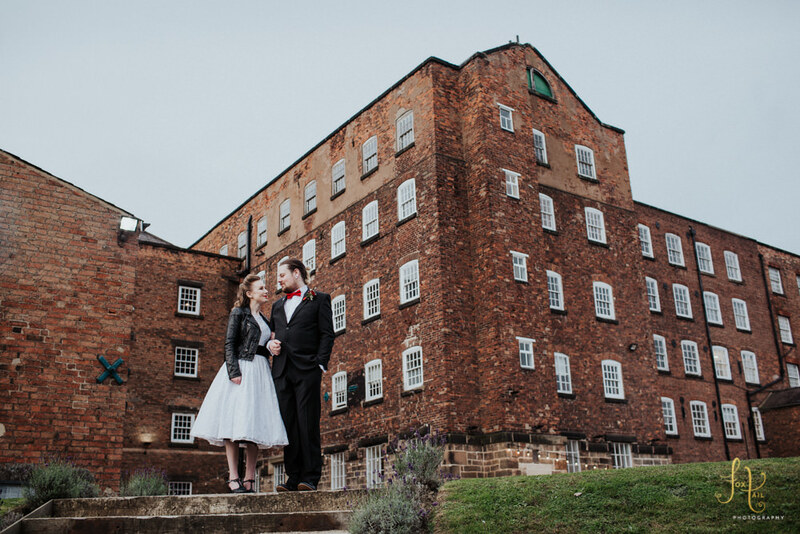 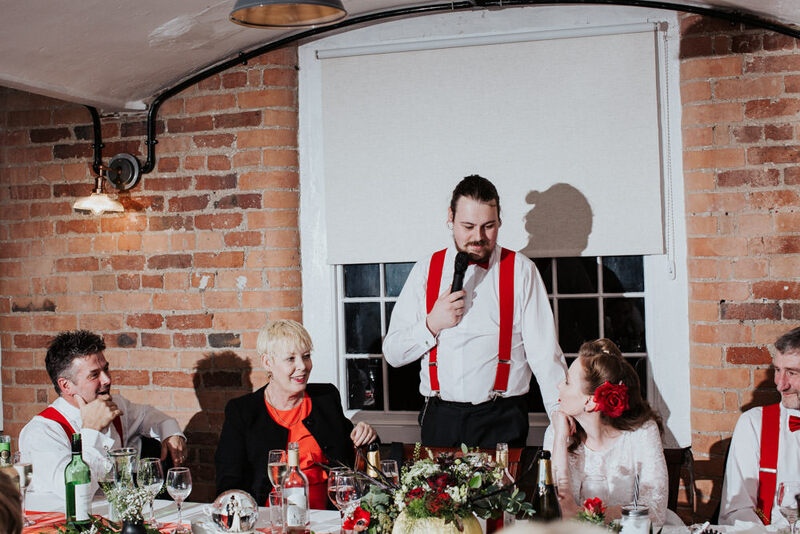 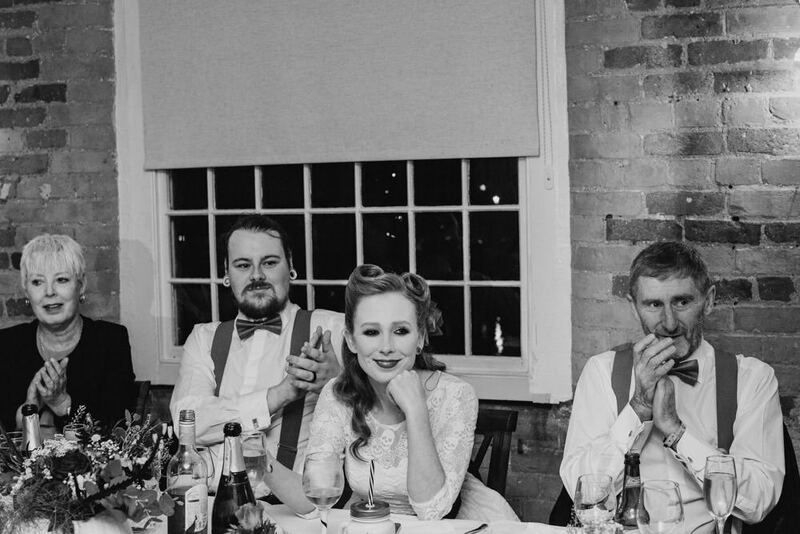 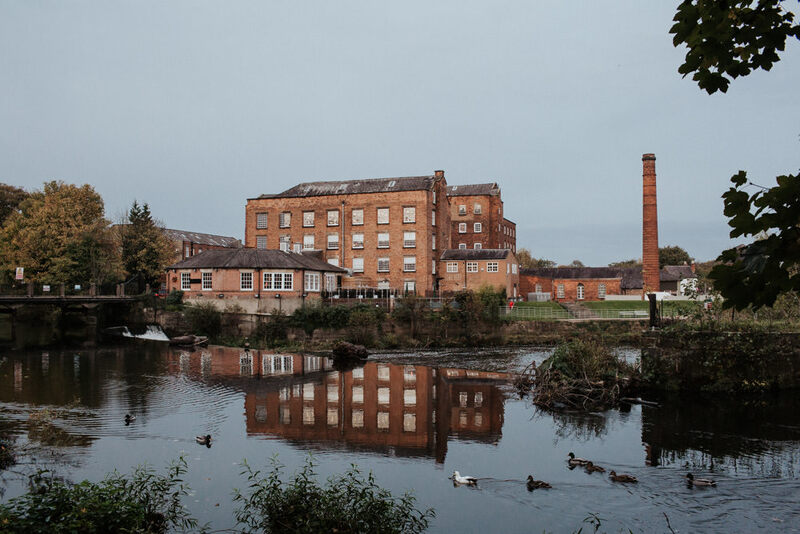 Lauren and Galen were married at the awesome West Mill in Derby, on Halloween. 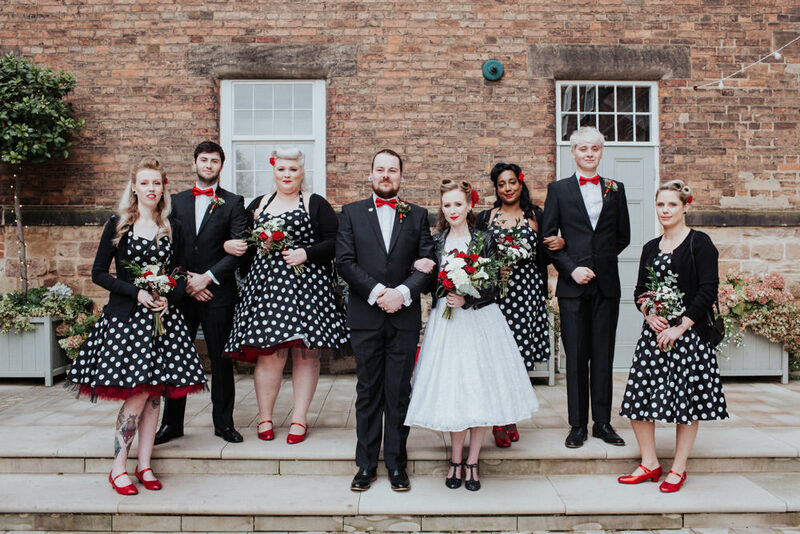 It was a brilliant wedding day with a mix of rockabilly and subtle goth/ Halloween themes throughout, with skulls all over the tables and flower filled pumpkins everywhere. 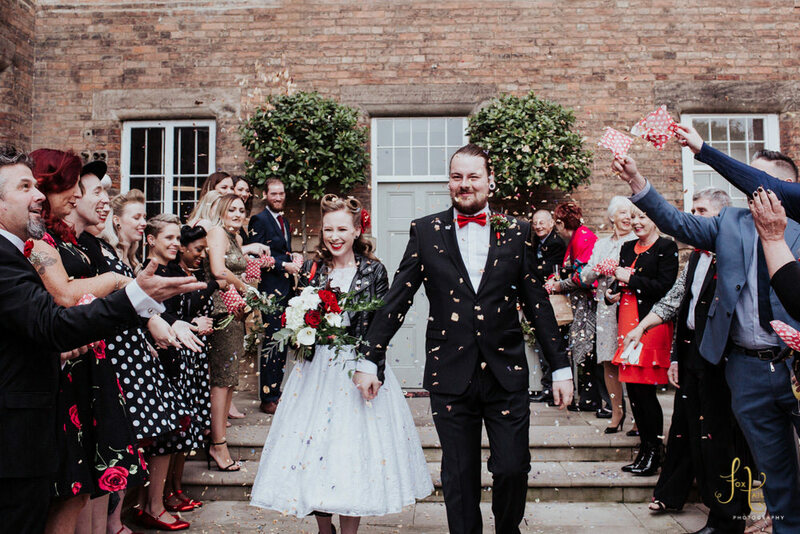 The couple met through work and have been together for some years before getting married. 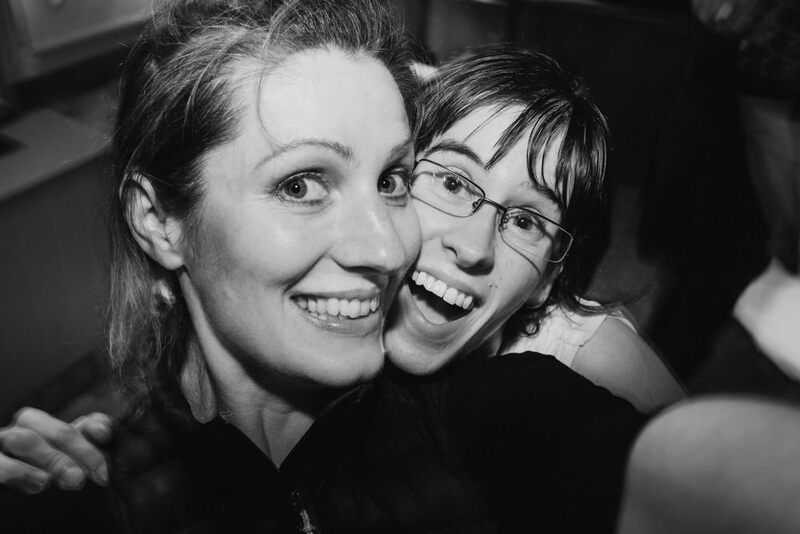 They are just the loveliest people. 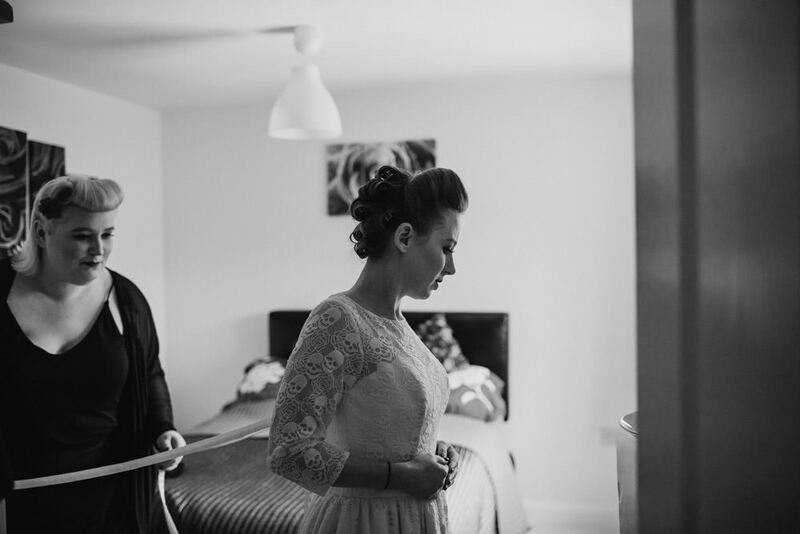 Lauren got ready at home with her bridesmaids, brideschap and parents, it was such a relaxed vibe. 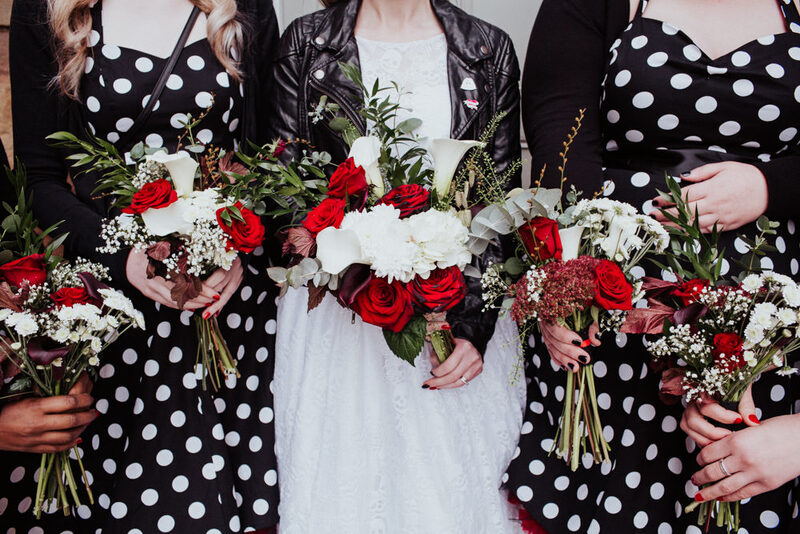 She wore a skull lace tea dress with hand painted leather jacket, and looked so incredible. 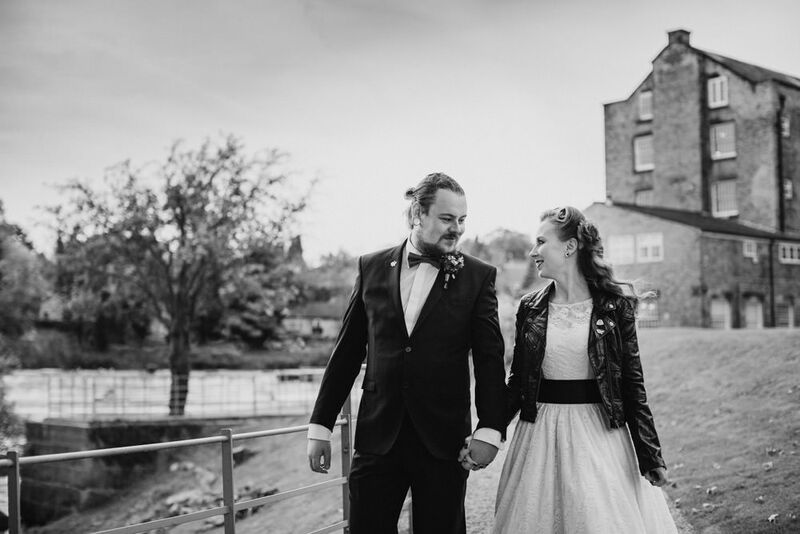 A stretched hummer then took them to the ceremony. 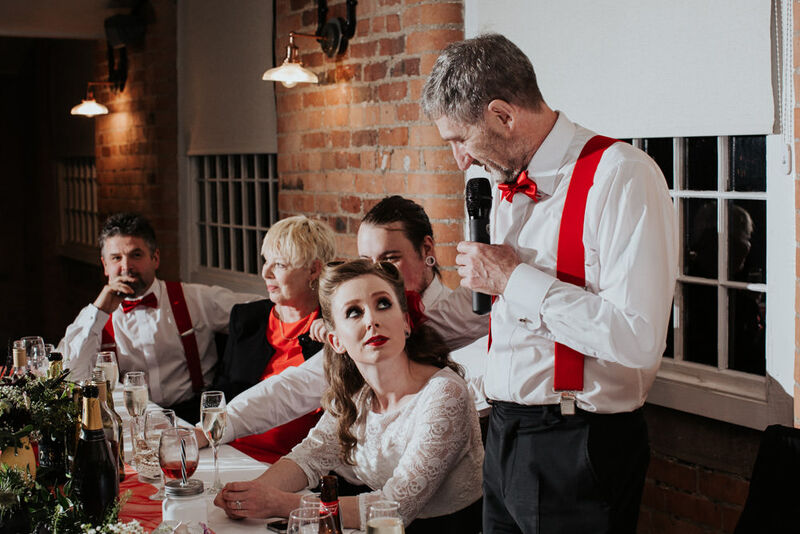 Galen wore a tuxedo with red bowtie and braces, he was looking super dapper, yet suitably goth for the occasion. 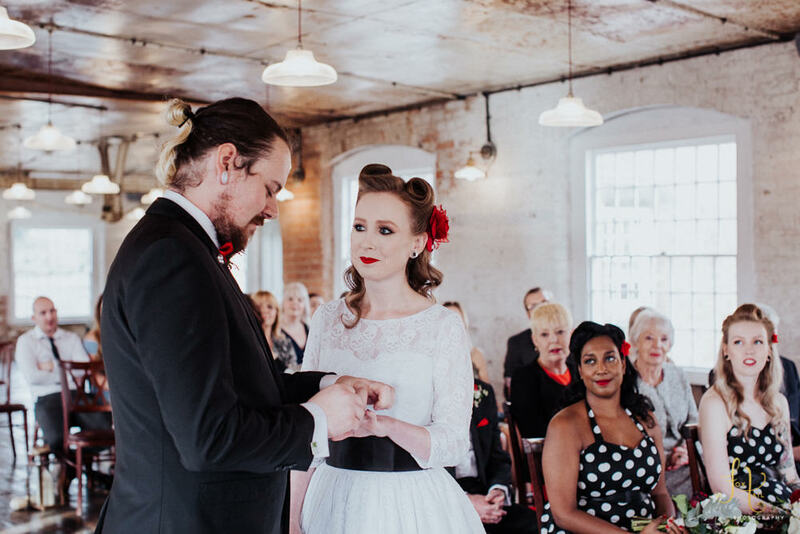 The ceremony took place in the industrial mill room setting of West Mill. 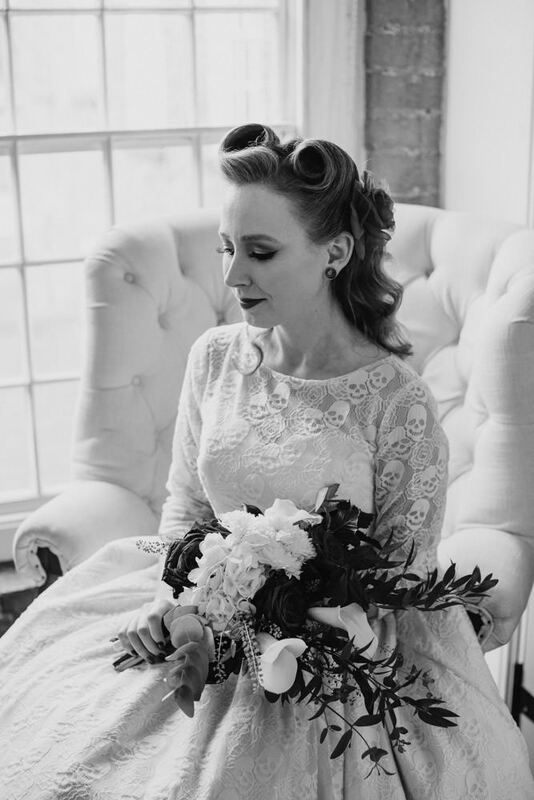 The isle was lined with lanterns, and paper skulls hung above the pumpkin and flower filled registry table. 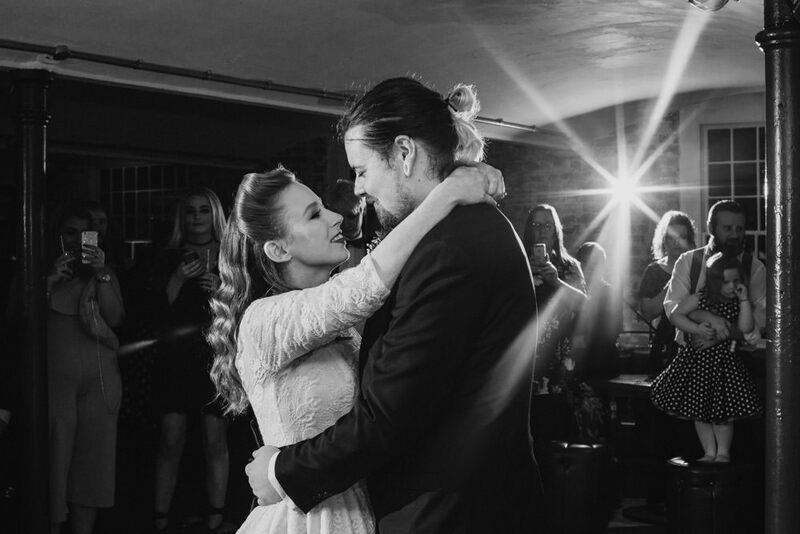 It was a gorgeous ceremony, full of private smiles and so much love. 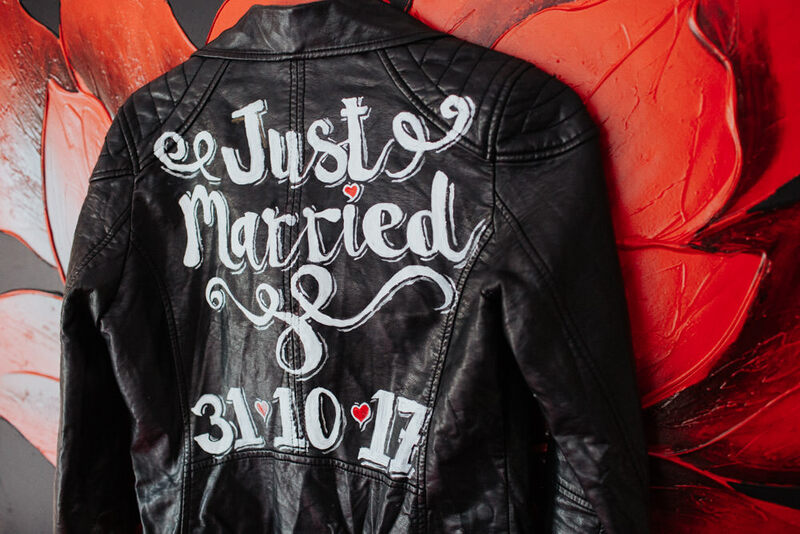 Lauren then pulled on her leather jacket, hand painted by one of her bridesmaids with the words ‘Just Married’ and the wedding date, to walk back down the isle with her newly wed husband. 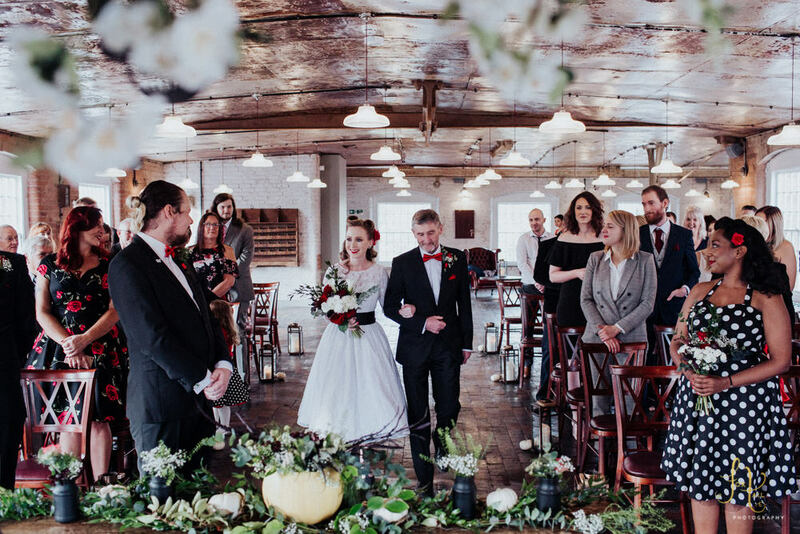 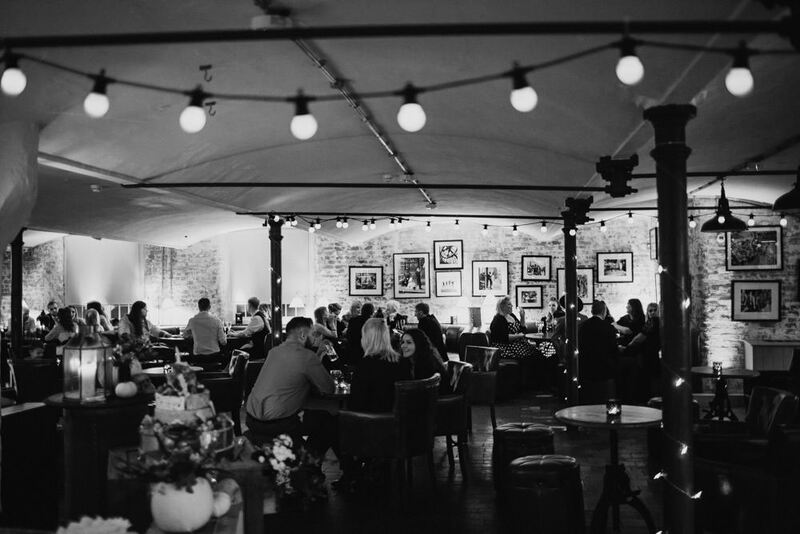 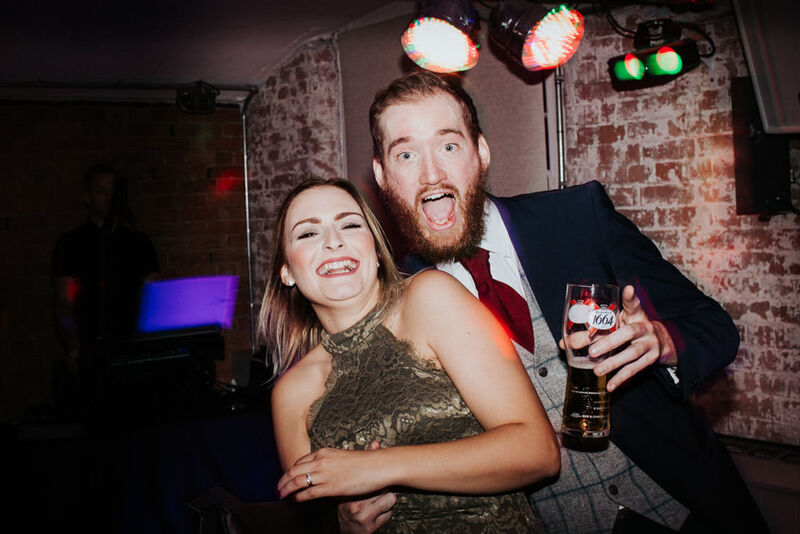 Lauren and Galen chose to have their wedding at West Mill because the venue has so much great character, yet can be personalised so easily and it’s a bonus that it’s near their home. 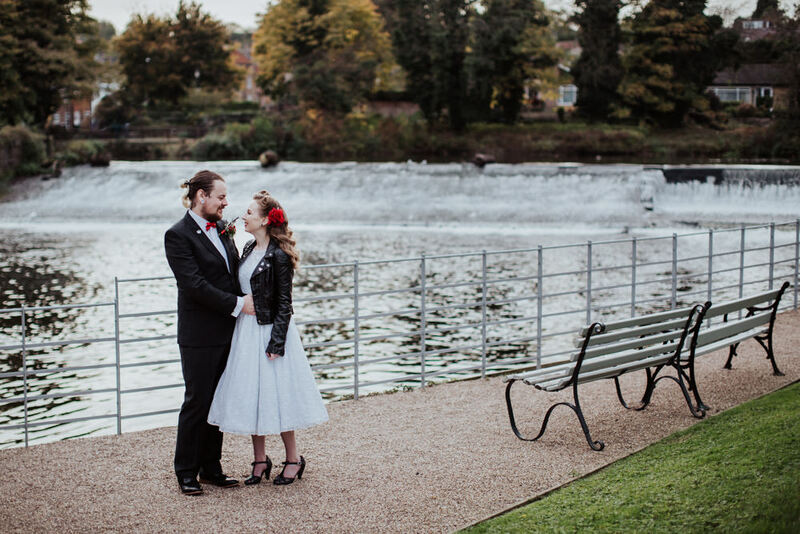 The weather was perfect, it was a beautiful day for some group photos outdoors. 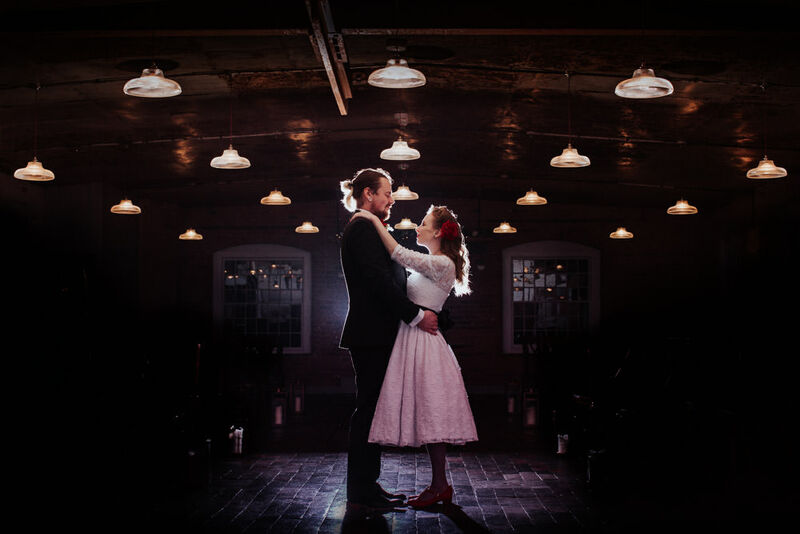 We then headed in and around the venue for the couples photos – Lauren & Galen were so relaxed and cool. 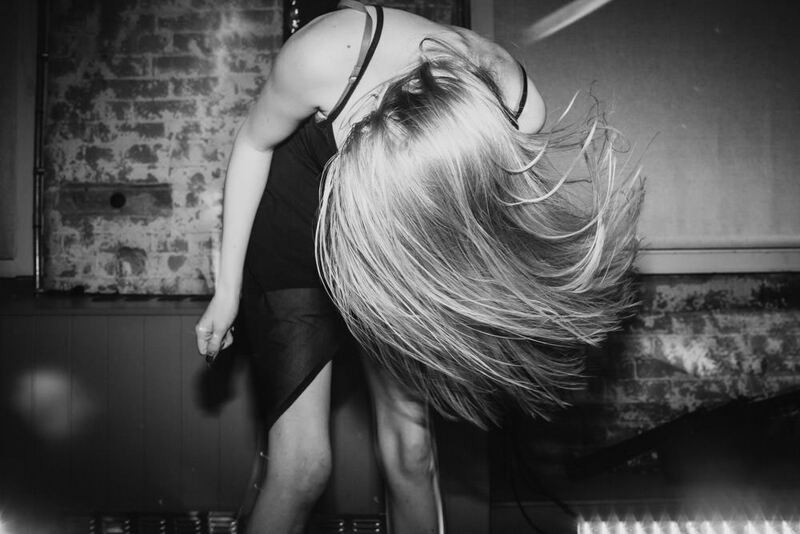 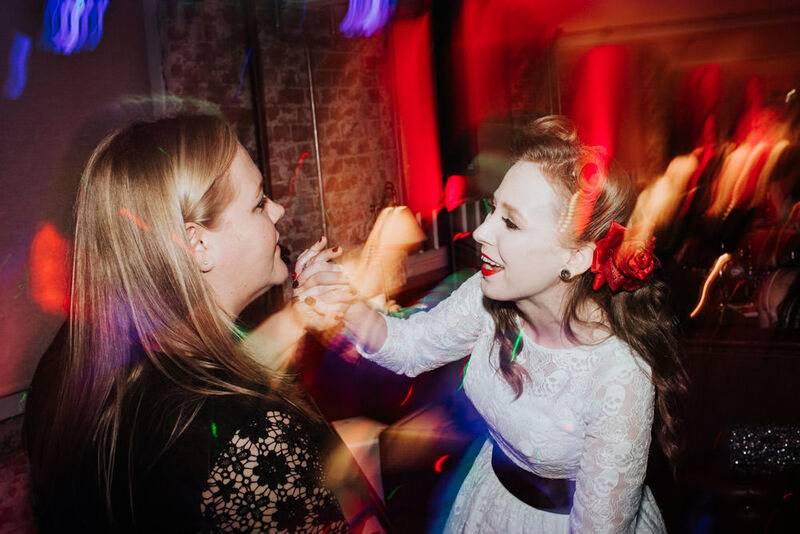 After dinner, guests played in the photobooth, and the dance floor got started. 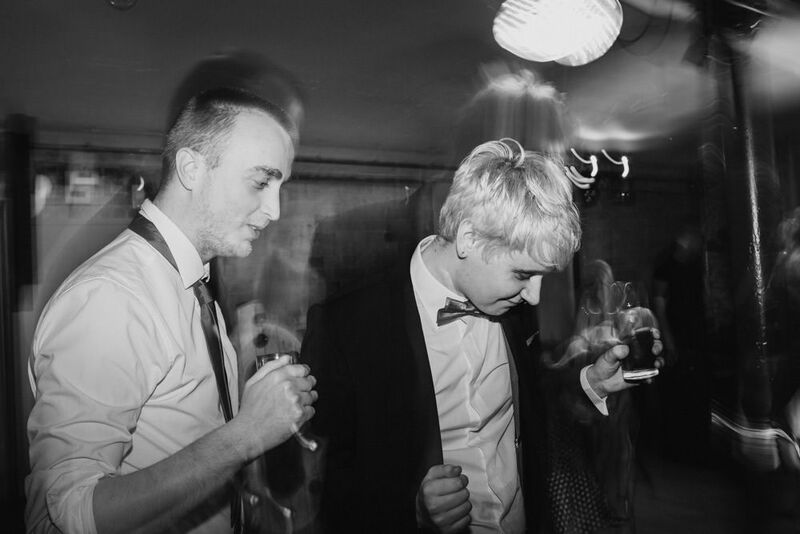 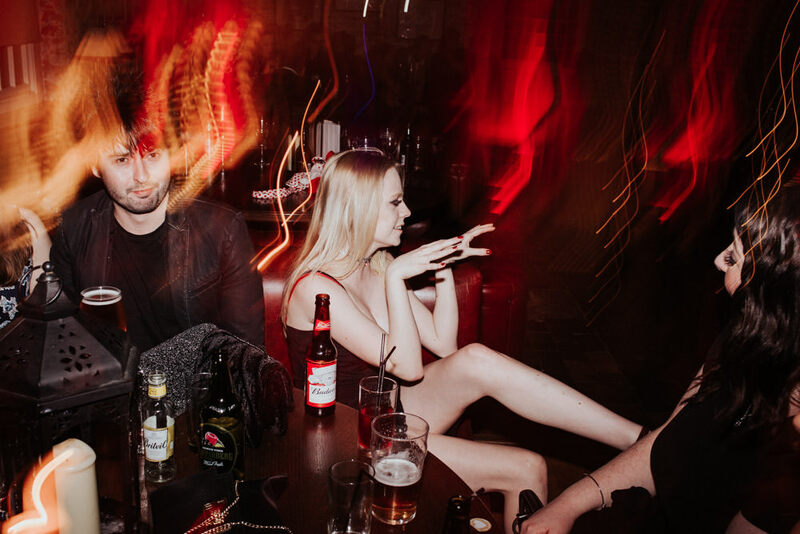 The DJ kept the party going all night and the music was so eclectic, playing anything from disney tunes to metal. 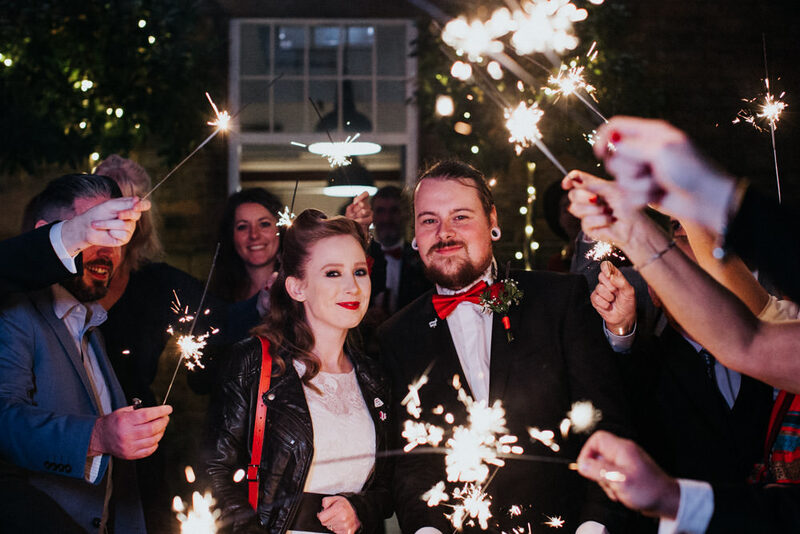 The evening ended with sparklers, which was such a wonderful idea and guest really enjoyed. 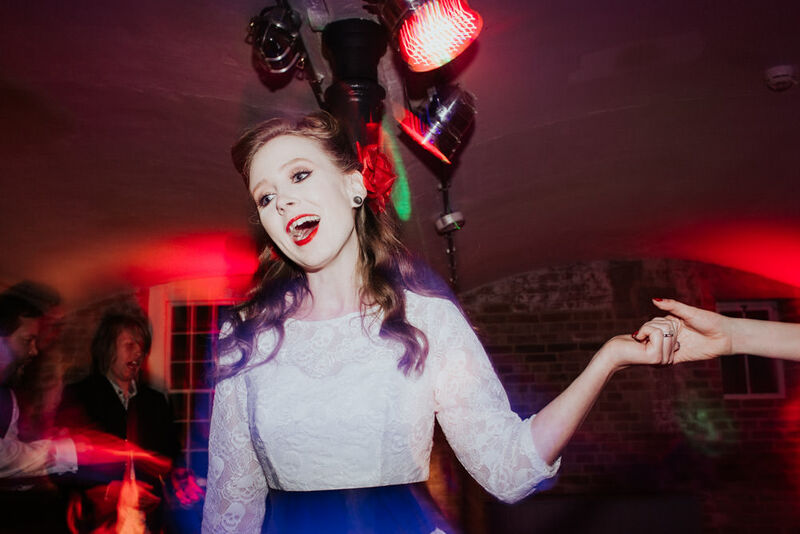 The whole wedding was so laid back, from the bride’s awesome skull dress to the sparkler exit. 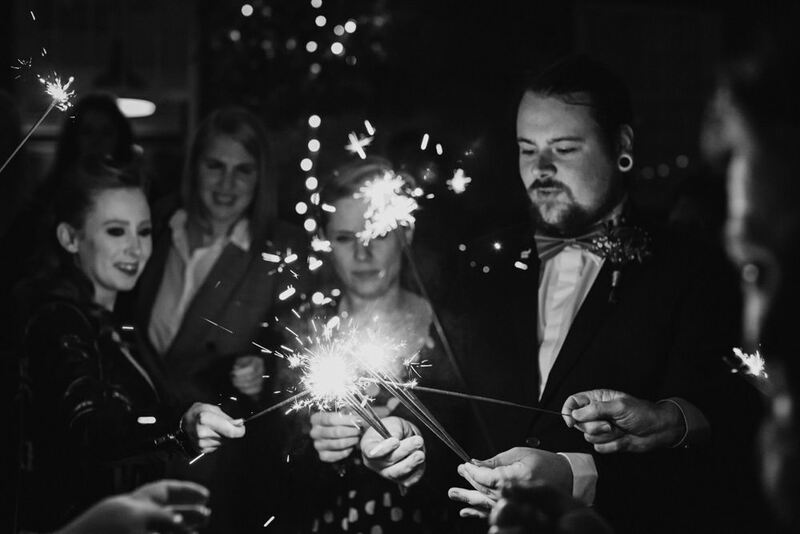 I love this wedding so much with how they made their day so unique and their own. 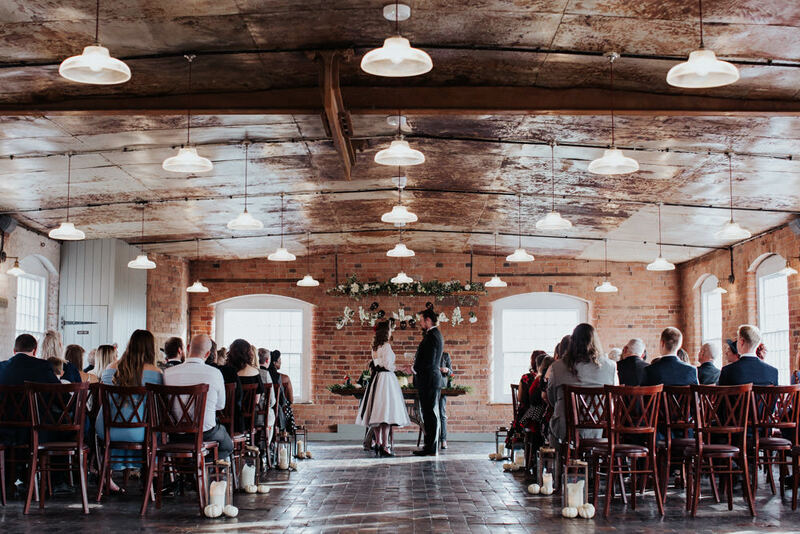 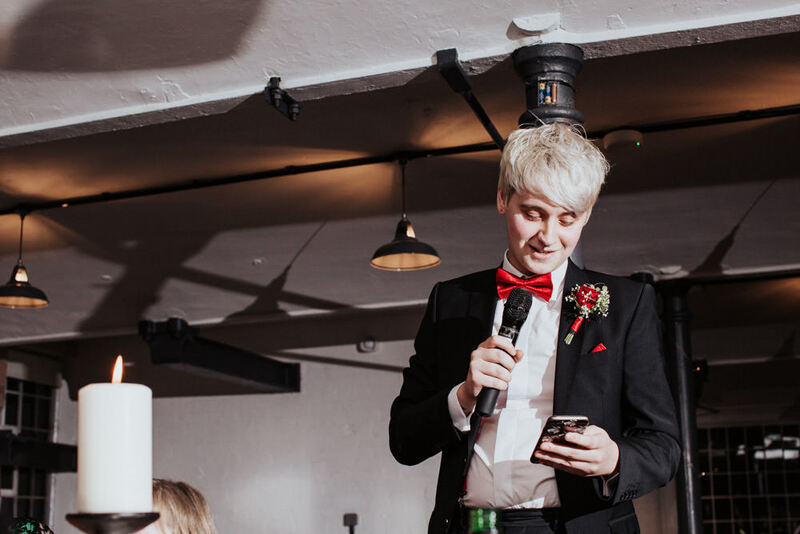 The couple says that if you’re planning your wedding, the biggest piece of advice they could give you is to taking a moment to think on the day to take it all in. 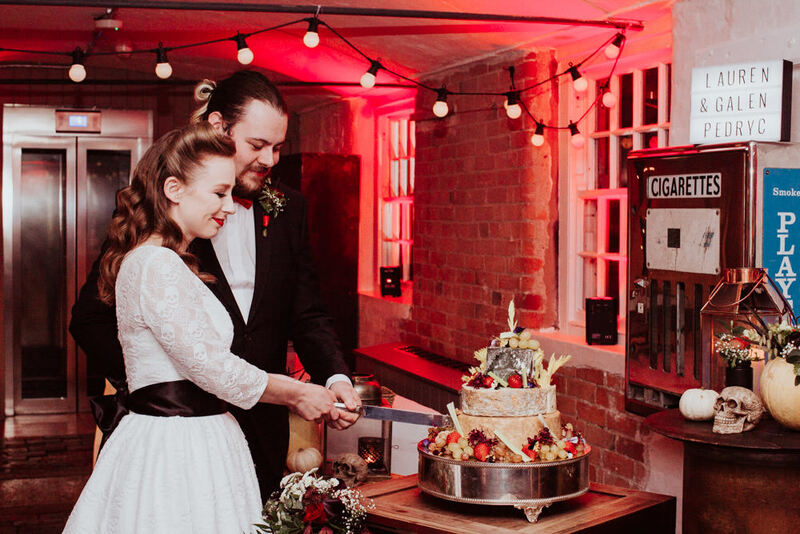 It goes SO fast! 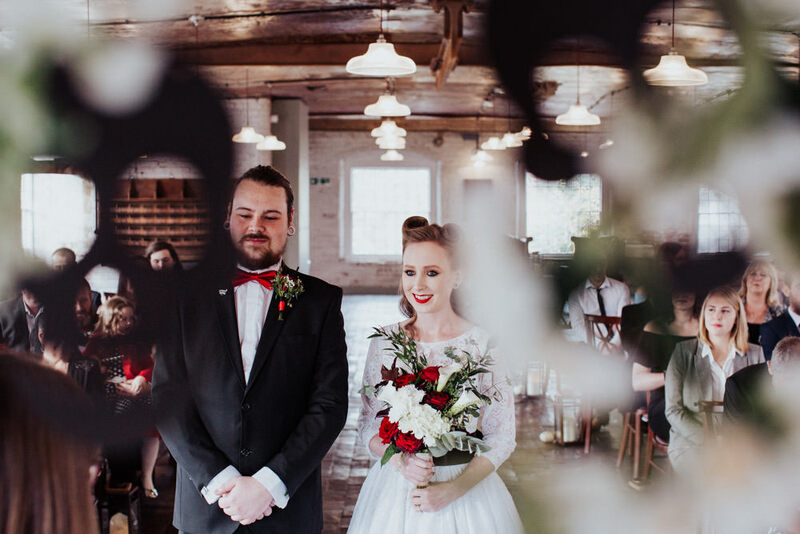 Check out more pictures of Lauren & Galen amazing West Mill wedding below! 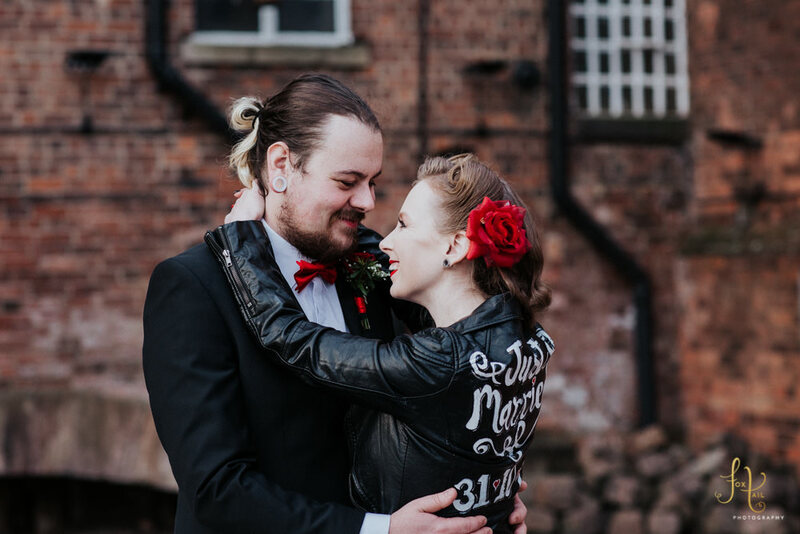 Brides leather jacket – Charity shop bargain, with painted hand lettering by a friend. 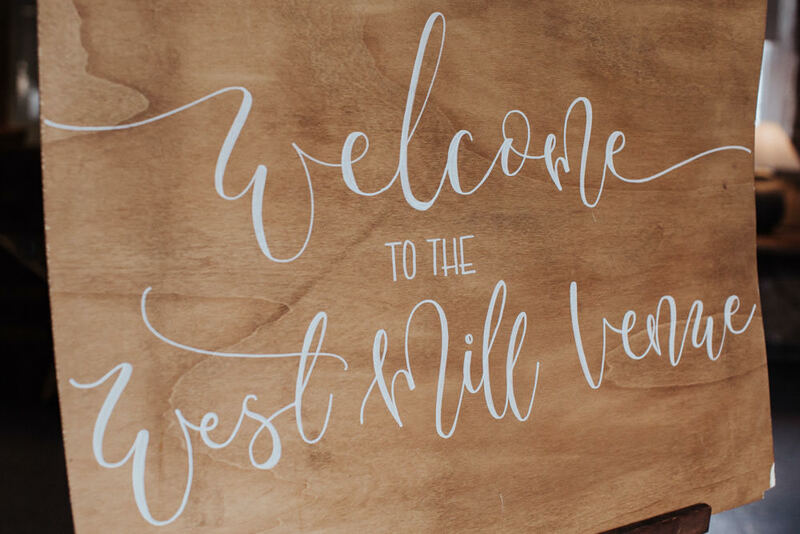 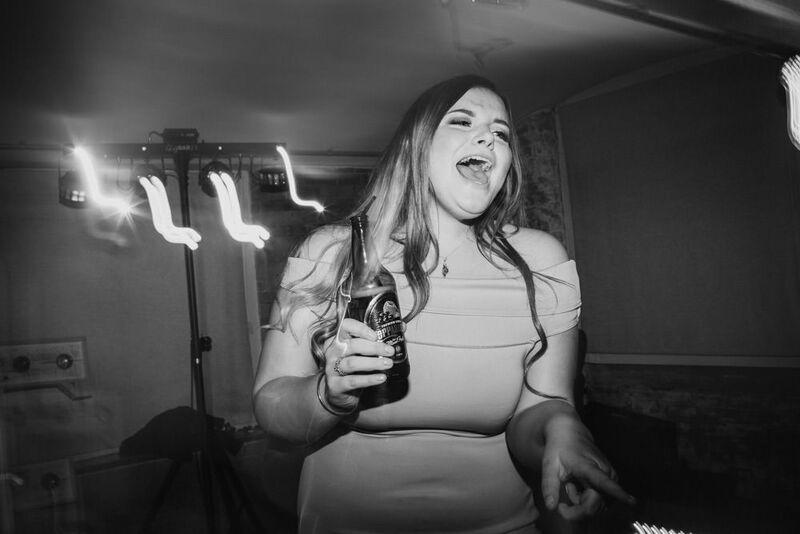 If you’re planning a West Mill wedding and in need of a photographer, I would love to hear from you!